apital T has assembled an all-star cast to tackle Sam Shepard’s dysfunctional family drama A LIE OF THE MIND openingMay 12th at Salvage Vanguard Theatre. ll three eligible shows for Capital T Theatre were nominated for a total of 11 B Iden Payne awards when they wereÂ announced last Tuesday. After members of the Greater Creative Alliance vote on their favorites, the awards will be handed out Monday November 1st at the Long Center. 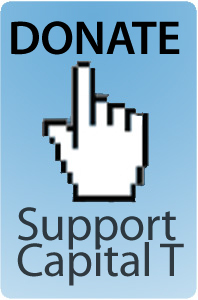 To become a member of GACA and support Capital T click here. Please help us congratulate all the nominees and everyone who helped to make these shows a success. apital T has assembled these nomadic actors into an amazing cast for our upcoming production of HUNTER GATHERERS opening October 14th at Hyde Park Theatre. Â While you will see some of your favorite local actors we are also proud to be the first to introduce an amazing talent to the Austin theatre in the bunch. The Austin Critics Table Award Nominations were announced last week, and Capital T received 2 nominations for their work in 2008-2009. THE BIRD AND THE BEE was nominated for Outstanding Production of a Drama. Company member Chase Wooldridge was cited for his work in the THE BIRD AND THE BEE with a nomination for Acting in a Leading Role.